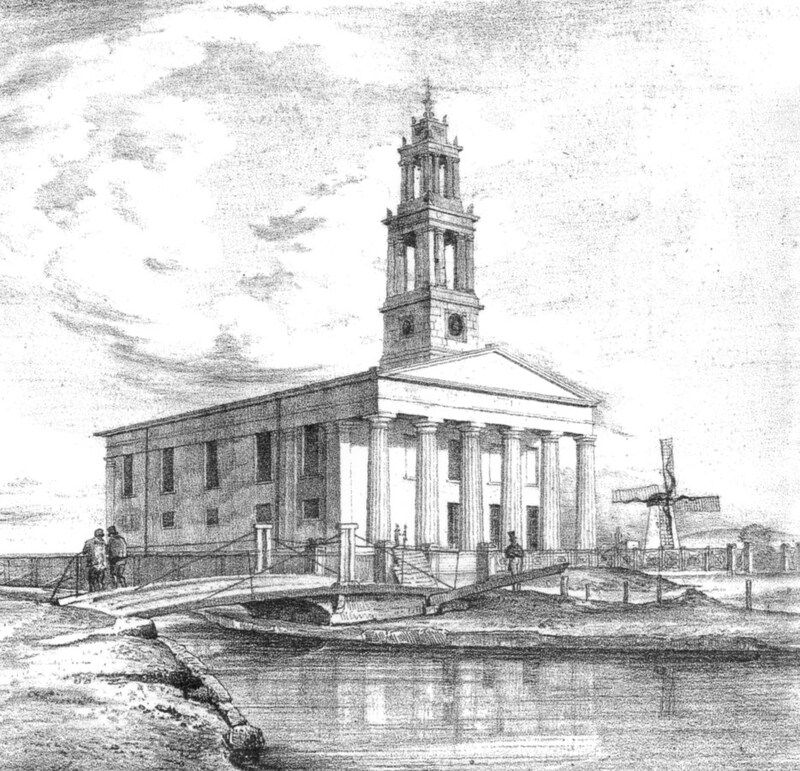 St George’s Church was built in 1824 to accommodate the local population explosion, which was too much for the Camberwell parish church of St Giles. But a century and a half on, with local housing reducing as the park developed, the building became impractical for the local congregation. It closed, became derelict, and was eventually converted to housing in 1994. Begun in 1822, and completed 2 years later at a cost of £20,000, St George’s was one of many ‘Waterloo Churches’ built to celebrate the Duke of Wellington’s 1815 victory over Napoleon at Waterloo. 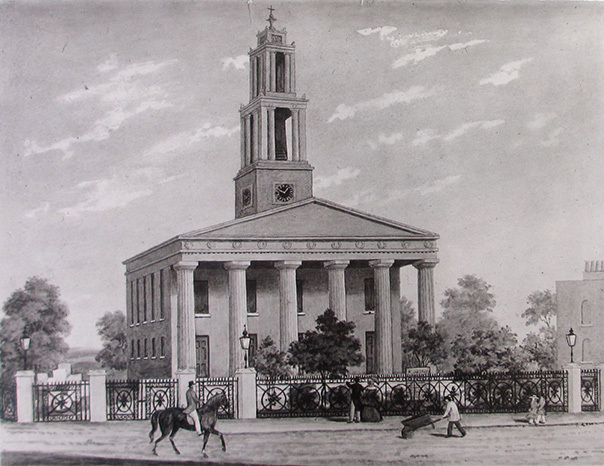 The architect, Francis Bedford, used similar ‘Greek Revival’ designs for St John’s Waterloo, Holy Trinity Church in Borough, and St Lukes, W. Norwood. The stone mason for the original work was John Day, who had a yard at Camberwell Green, and also built and owned the baths in Addington Square. In its early years, St.George’s stood virtually isolated – a towering landmark in otherwise largely open countryside. The adjacent canal had been constructed 10 years earlier, but the area was still mostly fields and market gardens. However, it was built to last, accommodating 1734 people, and was able to cope with the rapidly developing streets around it. It became a centre for the Trinity College Cambridge mission to inner city London, at the end of the 19th century, and was Grade II listed in 1954. However, as the local population reduced with the development of the park, it became something of a white elephant, and eventually the church had to move services out in 1970. Despite attempts to maintain it, no use could be found until, in 1977, it was sold to the Celestial Church of Christ. That same year, vandals broke into the crypt, desecrating coffins, graffiti-ing walls, mutilating corpses – apparently driving a stake through the chest of one corpse and playing football with a 100yr old skull! There was even talk of smallpox danger from the disturbed corpses and skeletons in the crypt. 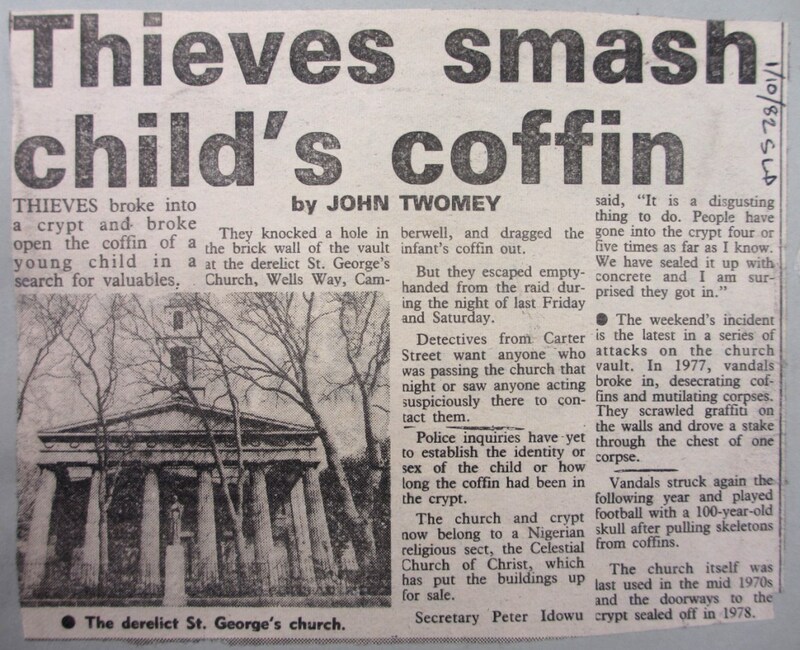 The church was badly damaged by fire in 1980, and left roofless and vandalised for most of the 1980s. Demolition looked likely, but various alternative uses were proposed, including an arts centre/recording studio and an indoor sports centre. Then, in 1993 it was decided to turn the shell into housing association flats. What was left of the remains in the crypt were re-buried in Nunhead Cemetery, on 11th October 1993. After a successful 18 month, £2m conversion, it re-opened in 1994 as 30 ‘Mediterranean-style’ one-bedroom flats, run by St George’s Housing Co-operative. 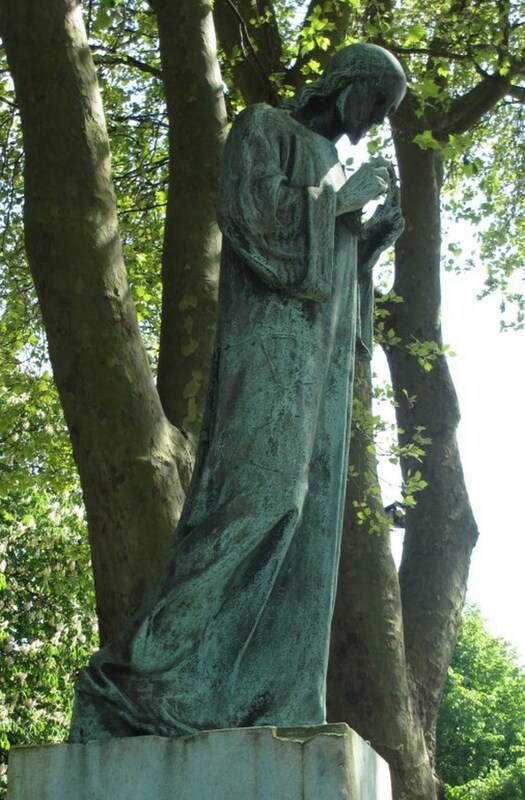 The expressive bronze Christ statue in the front railings is a 1919 war memorial. It’s by Arild Rosenkrantz, Danish painter/illustrator/stained glass artist – one of his very few sculptures. It was stolen in Aug 1991, only to turn up undamaged a fortnight later in a Brixton scrap-yard, following a newspaper appeal by the curate. 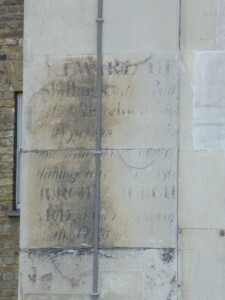 Can anyone decypher this sign on the side of St George’s?! It seems to be offering a Reward, possibly for information about persons damaging something. 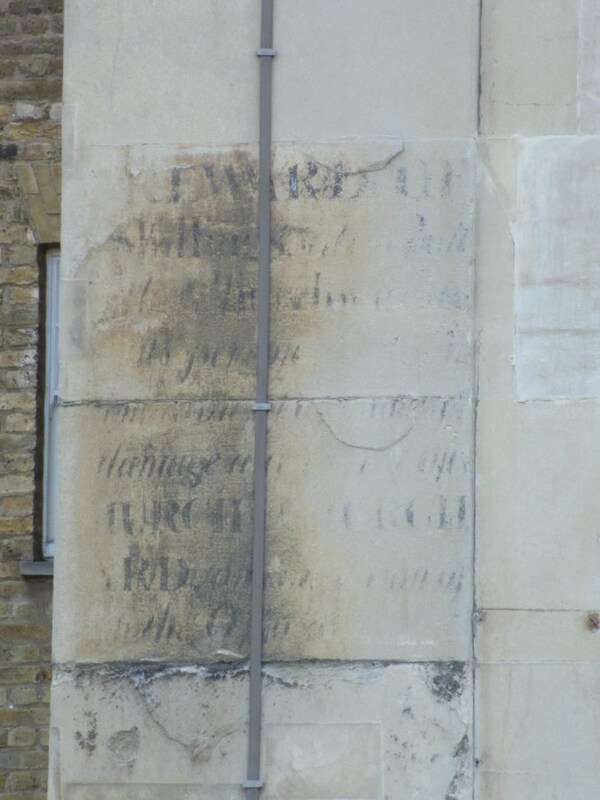 It may have been painted over and then painted a second time, so two sets of text seem to be visible. A lightening conductor runs through the centre, and the left side is very faded, possibly from water. Very fine signwriting, though! Have a look for yourself, from Jubilee Plaza by the underpass. I went to services at this church in the early to mid 1970s. it brings back lovely memories to see it again. I was born in Evelina Mansions in 1963 but moved away to Devon in late 1978. I often wondered if the the church was still there, and I’m so glad to see it is. I just found out that my paternal great grandparents were married at this church in December 1896. My grandfather and grandmother moved from London to Canada in the early 1950s after the war, having grown up in Dartford, Kent. My grandfather never mentioned a Camberwell connection so we were unaware. I moved from Canada to the UK in 2007 (my brother and mother in 2004 and 2006 respectively) and my brother always had a fondness for the area. We always lived in West London but my brother’s purchase of a flat in Peckham and my move to live with my fiance in Camberwell have brought us all nearby. Perhaps it was always meant to be! Does anyone have an idea of where Holmby Street was? It’s no longer on any maps but was an SE5 postcode. It’s where my great grandparents were living at the time of their marriage. Thanks so much for your reply. It’s very helpful and I’m so grateful someone knew where it once existed! My husband’s Great, Great, Great Grandparents, William and Mary Rolls were interred in the vault of St Georges, Camberwell. I read that what was left of their remains were re interred in Nunhead Cemetery. Does anyone know where I could find records of this event? In 1981-’82, I attended a 1 year post-grad studies at what was then LCP. I lived at what was then, I think called Walworth Methodist International Hostel. I would run weekly through the adjoining park for exercise. I always admired what seemed to be the abandoned St. George’s Church. I’m glad I found this site to learn of it’s history and new life for the community. In 1951 I was born in St Giles hospital. Lived in Villa Street, Walworth (cobbled road). I was christened and confirmed in St Georges Church in 1961. Every Sunday morning my friend and I attended the 9am communion service, after the service it was down to the vicars house where breakfast was served. My son was born at st. Giles hospital in 1958. We lived in the corner house facing st. George’s church and I too used to go to Sunday service before breakfast at vicarage! Wonderful memories. I went with a school friend to St George’s in about 1957. It was Corpus Christi and the first time I had been to a Sung Eucharist. The priest was Fr Geoffrey Beaumont and his C20th light music group was flourishing, with general shock-horror that the CofE was going to pot! Another priest presided while Fr Beaumont in a scruffy cassock played the piano and we raised the roof to ‘Alleluia, sing to Jesus’ with improvisation between verses and had Michael Brierley’s ‘modern’ tune ‘Camberwell’ to ‘At the name of Jesus’. I was sad to find the church closed and then demolished, but I became an organist and still play some of his music. Thanks for giving us your memories of St George’s! It must have been a very active place for a long time, until the local population started to dwindle after the park got under way. Fr Beaumont seems to be quite a famous hymn-tune writer: https://hymnary.org/person/Beaumont_G. But the church building is still there, thank goodness, and St George’s congregation is still going strong, but in a modern building nearby. You’ll be pleased to know they do have a ‘real’ organ there too! My great x2 grandparents were married in St George’s in 1835, and also his brother and her sister in 1833! I was wondering who owns the church now and what is it used for?